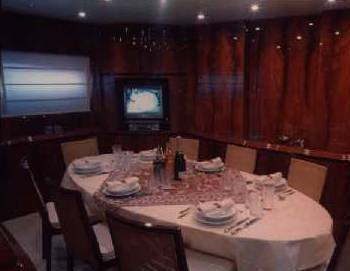 M/Y KIWI is a brand new MAYORA 95ft, built in 2001 and fully air-conditioned throughout. 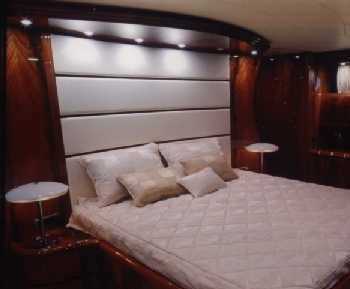 It can comfortably accommodate 8 guests in one master cabin with Jacuzzi, one VIP cabin, and two twin cabins. There is a plasma TV in the saloon as well as a home theater. CD players are available in all cabins. Among the wide variety of water sport equipment that KIWI offers are 2 Jet- ski's; Yamaha 1200 and 750 hp respectively. 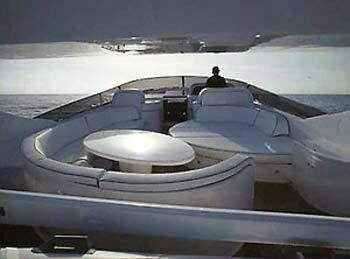 It has a novurania 4.30 m with 50 hp engine and a second tender of 2.20 m length. It finally has dining and a BBQ area on the fly bridge. 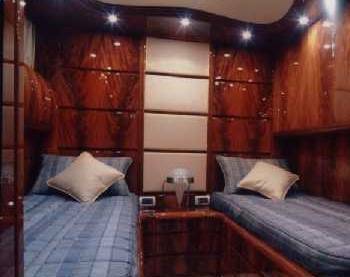 ACCOMMODATION : 9 guests in 4 cabins, 1 Master Cabin, 1 VIP Cabin, 2 twin Cabins, all with ensuite facilities, (Jacuzzi in Master Cabin), 5 Crew in separate quarters. 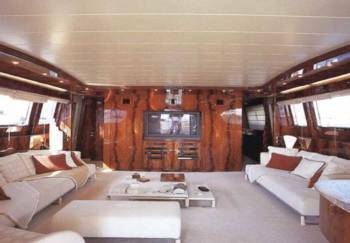 RECREATION : Plasma TV in Saloon and in all cabins, CD player in all cabins, DVD- VCR-VIDEO- SONY Playstation- Music / Home Theatre in saloon, 2 jet ski's: Yamaha 1200 HP and 750 HP, Novurania 4.30m with 50HP Engine, second tender 2,20m, swimming platform, dininig and BBQ area on the flybridge.